Before 1937, the land on which Winkworth Arboretum now stands was a neglected corner of farmland belonging to the Thorncombe Estate. The steep slopes, unsuitable for cultivating, were left as natural woodland with odd patches of forestry plantings. Dr Wilfred Fox, a dermatologist at two London hospitals, lived at the neighbouring Winkworth Farm and loved the natural landscape. As his hobby, he was passionate about trees and long before he bought the land for his arboretum, he founded the Roads Beautifying Association in 1928 with the aim of promoting ornamental tree planting. When he got the chance to buy the neighbouring parcel of land to assemble his own collection of trees and shrubs, he did so. He was initially dismayed during the early years of the war when the Ministry of Supply commandeered the wood from his larch plantation to be used as pit props. 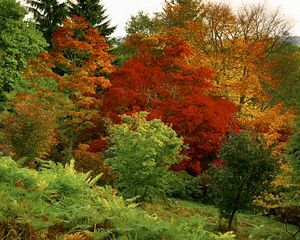 However the empty amphitheatre, which he christened "The Bowl" soon became filled with his most colourful collection of azaleas, maples, acers and Persian Ironwoods whose curled leaves turn vivid red and orange in the autumn. His close friend, W.J.Bean, was curator at The Royal Botanic Gardens Kew and he encouraged Fox to broaden his collection. Over the years the wonderful estate has won many prizes from the Royal Horticultural Society, and Dr Fox received the Victoria Medal of Honour, the RHS's highest honour. Altogether this award-winning collection has more than 1,000 species of shrubs and trees, each chosen for their colour, rarity and beauty. Once established, Dr Fox wanted to share his arboretum with the general public so he donated 62 acres including the Upper Lake to The National Trust in 1952 and chaired the committee until his death in 1962. The National Trust has since procured the remaining 35 acres and the Lower Lake. Highlights of the Winkworth Arboretum change with the seasons. In the spring, magnolias, cherries and stunning azaleas light up the woodland and underfoot there are acres of bluebells with informal paths mown through them. In summer the Arboretum lends itself to family walks and picnics. The Arboretum really comes into its own in the autumn with bright reds, golds and orange foliage on the maples, rowans, tupelos and whitebeam. At the top of the Azalea Steps, pause beneath the Katsura tree as it gives off a rich smell of burnt sugar in the autumn. Cotoneasters and the red-hot glow of the enkianthus perulatus enhance this beautiful setting. Wonderful funghi can also be spotted in the damp undergrowth. The Winter Garden is particularly well planted with many species of holly. Trails lead off in all directions, providing pleasant winter walks amidst the abundant wildlife. The Arboretum has two naturally landscaped lakes which offer superb reflections of the surrounding colour. The Azalea walk leads down to the boathouse on one of the sizeable meres. There is also a wetland area with a boardwalk which was constructed of recycled plastic bottles in 2003. Herons and kingfishers now occupy the area. Winkworth Arboretum has plenty of free parking and also has a friendly tea room with delicious homemade cakes and light lunches, making it a great place to visit at any time of year. Arriva 42/44 Guildford-Cranleigh (passing close Godalming). Near Hascombe, 2 miles south east of Godalming on east side of B2130.